Mumbai: The ICC board meeting which was scheduled to be held in Dubai for two days (Wednesday and Thursday) finished on Day 1 itself, it is learnt here. 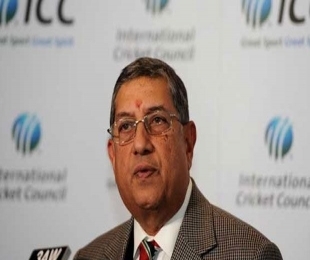 According to the highly placed sources in Dubai, N. Srinivasan addressed the Board members in the morning on Wednesday. "There is no issue to my presence here and there is no threat and (I) am facing no problem," he apparently told to the ICC board. "Whatever verdict given by the Supreme Court of India is a private matter," he went on saying this. The issue of banned Pakistani pace bowler Mohammad Amir was discussed and the bowler's ban is set to be revoked on certain conditions, it is also learnt here. The Anti-Corruption and Security Unit (ACSU) has promised to be very strict during the World Cup and strict code of conduct for players has been imposed, according to sources. The fate of chuckers will be decided by Anil Kumble-led cricket committee. The board members also attended the dinner hosted by the ICC.